Last time we discussed how expertise, mastery and haste affect the smoothness of our damage intake by analyzing the output of a Monte-Carlo simulation. From those results we determined that if we consider a string of 5 boss attacks, stacking hit and expertise to their respective hard caps was the most effective way to eliminate the top 10-20% of spikes. We also learned that the question of “mastery or haste” after that cap is a bit ambiguous – haste seems better at eliminating the top 10% of spikes, but mastery is better for the top 20%. From the discussion that followed, we came up with a few new questions. First, does the number of hits we’re considering matter? I hypothesized that part of what made haste pull ahead was that it caused SotR to cover the first and last swing in a set of 5 by increasing the SotR cast rate above the 1-per-7.5-seconds threshold. But what happens if we only look at a 4- or 3-attack moving average? Conversely, Brokenone wondered whether mastery would pull ahead for a 6-attack moving average as well. Since all of the moving average calculations are done in post-processing, it’s easy to calculate these values once we’ve generated a data set, so we’ll calculate the results for everything from 2 to 7 attacks just to see what happens. Its clear that hard capping both Hit and Exp are amazing for cutting out the worst of the spikes. However, I now wonder if those two are *so* good at their job that the relative smoothing value of Mastery and Haste are less valuable than they otherwise would be. I mean, sure, a smoother damage intake is always nice, but once your 90% results are cut down to almost nothing some of that value is lost. As you can see, all I’ve done to get #9 was to shift the majority of the mastery into dodge and parry in roughly equal amounts. Unfortunately, I’m not going to give you many graphs this time around. The simulation generates 18 different graphs (2 for each set), and in theory I could generate five times that many (one for each number of hits we’re considering). But that’s a lot of graphs to peruse, and frankly, it’s hard to get anything useful out of them. They all look more or less like the ones in previous posts. Trying to post all of them would be information overload, and choosing a subset would be sort of meaningless. Instead, I’m going to hit you with tables upon tables of data, and draw your attention to the interesting bits (since reading and dissecting tables of data is probably not anyone else’s idea of a fun afternoon). In the tables below, “S%” is the Shield of the Righteous uptime expressed in percentage, “mean” is the mean of the moving average DTPS histogram (which is also our normalized mean DTPS, out of 1), “std” is the standard deviation of the moving average DTPS histogram, “80%” is the percentage of events that fall above 80% maximum possible DTPS, and “90%” is the percentage of events that fall above 90% maximum possible DTPS. “S%” and “mean” don’t depend on the number of hits, but I’m going to list them in each table just for convenience. Note that all of the following tables are generated from the same data set. In other words, I have data for 10000 minutes of combat for each of the 9 data sets, and that data is basically an array of damage values corresponding to the combat results from the Monte-Carlo. All I’m doing for each table is performing a different moving average on that data. So if there’s a variation from one table to another within a single gear set, it’s not due to that sim being “luckier” or “unluckier” than the previous one. It’s the same data, just averaged differently. OK, so what does all that mean? First of all, let’s look at the 5-attack data. The exp/avoidance set (#9) is actually a little better than the exp/mastery set (#8) at reducing 90% spikes (0.0217% of all events vs 0.0255%). However, it’s almost two times worse at preventing 80% spikes. Curiously, it actually takes a little more damage overall than the exp/mastery set too. This seems unintuitive at first, but it’s something we’ve seen before in the analytical calculations. Having so much hit and expertise increases the value of mastery to the point that it’s flat-out better than avoidance for TDR in addition to being better at smoothing damage intake. This is the hit/exp/mastery/haste synergy at work, and it’s an incredibly potent interaction. Note that at the other extreme, the high-avoidance set (#4) still gives us the most total TDR, as expected. But the mastery (#5) and exp/mastery (#8) sets come pretty close, while doing a far better job of reducing spike damage. What about strings of less than 5 hits? On the 4-attack table, the expertise sets still dominate at spike mitigation. Interestingly, the exp/haste set (#7) is simply better than the exp/mastery set (#8) for 4 attacks, even for 80% spikes. That might mean we have to toss my “bookended by SotRs” theory out the window, because we literally can’t guarantee that we bookend a sequence of 4 attacks. On the other hand, we can guarantee we have SotR up for at least one of those 4 attacks, and with fortuitous Grand Crusader procs sometimes more than that. So we may just be seeing the effect of guaranteeing that one out of four attacks is affected by SotR. The other thing to note about the 4-attack table is how much worse the avoidance sets get. Both the avoidance (#4) and exp/avoidance (#9) sets have horrible 90% values, well in excess of 1.5% compared to less than 0.05% for either exp/haste or exp/mastery. We probably could have predicted this – since avoidance isn’t guaranteed, you should see larger variations on short time scales. If we move up to the 3-attack table, things get a little less clear. We’re now looking at 4.5-second time scales, which is short enough that we’re not able to guarantee SotR coverage for even one attack. This is an interesting regime, because all of the sets perform more or less the same at the 80% threshold. The exp/mastery set has a small lead, but not by a large margin. The 90% threshold is a little more established, with the expertise-based sets having a clear advantage. Curiously, the exp/avoidance set (#9) can almost keep up with the exp/mastery (#8) and exp/haste (#7) sets here. The pure avoidance set (#4) falls drastically behind though, which is as expected. We’ve hit some sort of sweet spot here at 3 attacks, such that reaching the hit or expertise cap is the primary thing that matters, presumably because it means almost all strings have partial SotR coverage, and the rest of the details don’t matter as much. I hesitated to even include the 2-attack table, simply because I’m not sure how useful it is. It’s not clear that two attacks is enough to truly consider a “spike,” let alone something we optimize around. But since I had it, I figured it was only fair to show it and discuss it. Two attacks is basically the limiting case, because it’s meaningless to consider a single attack. And it’s also a regime where hit and expertise are going to have the least influence because SotR uptime is absolutely not guaranteed. Even with fortuitous procs, we’ll have some strings of back-to-back attacks without SotR active. And, perhaps as expected, the 90% results are all very similar. The exp/haste (#7), exp/mastery (#8), and pure mastery (#6) sets have a small lead, but certainly nothing like they do in the longer sequence data. If we drop our threshold to 80% spikes, they still maintain a healthy lead, and the weakness of the exp/avoidance set (#9) becomes apparent. The random nature of avoidance is really not well-suited to 2-attack strings, and it shows here with a ballooning percentage of 80% events. Again, I’m not sure how seriously to take the 2-attack data, but I think it’s safe to conclude that exp/haste and exp/mastery are certainly still quite viable on short time scales, and are probably still our best gearing strategy for back-to-back attacks. Now let’s turn our attention to the longer-sequence data. If we bump up to strings of 6 attacks (9 seconds of combat), we see a fairly familiar picture. Expertise still dominates, and by moving up to 6 attacks from 5 we get another factor of ~10 reduction in the number of 90% spikes. Most of the other gear sets see a similar reduction, though none of them get quite as much improvement as the expertise sets. You can see that there are definitely more events at 80% for set #9. So the apparent “badness” (for lack of a better term) of set #9 is just that the “edge” of the distribution falls just above our 80% cutoff, while the “edge” of the distributions for #7 and #8 fall below it. The exp/mastery set (#8) really shines here though, pulling ahead of the exp/haste set (#7) by almost a factor of 10 in the 80% bracket. This is less due to the stochastic nature of block (though I’m sure that helps) and more due to the fact that at such long time scales, we’re going to have a decent amount of SotR coverage. Getting more coverage via haste is just not as powerful as buffing the mitigation that we do have in that time range by stacking mastery. Finally, let’s consider the 7-attack table. This is again a limiting case, as a spike that lasts longer than 10.5 seconds is pretty uncommon (hopefully within 10 seconds, somebody’s noticed you’re in trouble and done something about it!). But in any event, the expertise sets continue to dominate here, all but eliminating 90% events to four decimal places. Thus, they all do more than 100x better than any of the other sets at getting rid of those 90% events. The expertise/avoid set (#9) still suffers from its broader distribution in the 80% bracket. Curiously, the expertise/haste set (#7) is actually starting to fall behind some of the other non-expertise sets in this bracket, specifically the sets with higher mastery (#5, #2 and #3). We see the same sort of exp/mastery dominance that we observed in the 6-attack data, making it the clear winner for strings of 7 attacks, and probably anything longer than 7 attacks. To be honest, I was a bit surprised by the results. I didn’t expect the dominance of expertise hard-cap to be so universal across different time scales. Again, I figured it would be good, but I didn’t realize just how thoroughly it would trounce everything else. After seeing these results, I don’t think there’s any doubt – hit cap and expertise cap are our first gearing priorities for a “control” gearing strategy. Beyond that, we have more flexibility. The exp/avoidance set didn’t perform all that poorly, but it also never stood out compared to the exp/haste or exp/mastery sets. 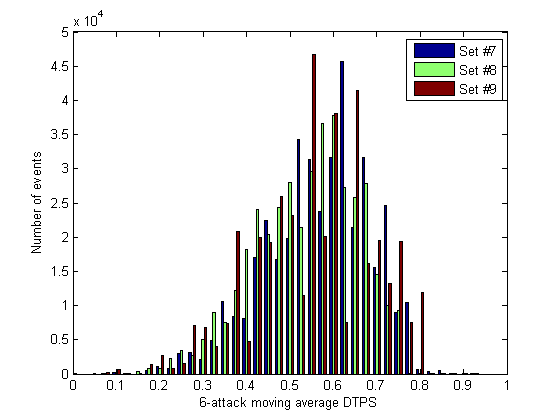 It gave us a little better spike protection against 90% events in the 5- and 6-attack brackets, but was also far worse (by a factor of ~2 to almost ~100) at dealing with 80% spikes in those same situations. At shorter time scales it was far worse all around, and there’s no apparent advantage at longer time scales either. So avoidance isn’t explicitly bad, but it’s definitely not as attractive as haste or mastery. It’s hard to recommend the expertise/avoidance strategy over exp/haste or exp/mastery. Both haste and mastery have their strong points. Mastery seems to give you the most effective coverage at longer time scales, while they’re about the same at short time scales. Haste is arguably stronger (but not much) for 4-5 attacks, but at 3 or fewer it’s really a toss-up. If we’re assuming that we care about 5 or fewer hits, then you’re pretty safe choosing either as your go-to stat (after hit/exp caps, of course!). Again, haste has the advantage of giving you a non-trivial amount of DPS, which will probably tip the scales in favor of haste for hard-mode raiders. For tanks progressing at a slower pace, and thus not as concerned with personal DPS, exp/mastery is perfectly acceptable as well. This entry was posted in Tanking, Theck's Pounding Headaches, Theorycrafting and tagged Active Mitigation, blocking, Min/Max, Scaling, tank, tanking, theck, Theorycraft, theorycrafting, warcraft, WoW. Bookmark the permalink. Looks great Theck! It’s pretty exciting that haste is a viable alternative to avoidance and mastery. Extra damage for very little survivability loss (and sometimes a gain)? Yes, please! What about factoring in Seal of Insight’s huge HPS? Or even Battle Healer? I’m sure it’d be a PITA. I’ve considered & started gearing expertise / haste. Not only does haste help with coverage, but more attacks = more self & raid healing. For Stone Guards (normal), I needed little over 20k HPS from healers to stay alive, not to mention some raid AoE heals I was throwing out. Haste doubles as self HPS & raid HPS. This all of course assumes your tank is decent at his or her rotation, correct? Like with any DPS theory rafting, sometimes you have to take into account the rotation being dropped on the floor. With that in mind, I’m seeing here is marginal gains for exp/mastery over exp/avoidance if you’re good at keeping SotR up, and quite likely more than marginal DPS gains for exp/haste over the other two if your rotation is bang on. So for your average to worse players, exp/avoidance is likely the way to go. The distinction is needed because the paladin tanks in my guild range from awesome to asleep at the wheel. Love this post though, I definitely enjoyed the details. Yeah, I think you’re completely right. A tank that’s keeping up a good rotation should be aiming for exp/haste or exp/mastery. A tank that’s sloppy would probably be better off with exp/avoid, or potentially even just stacking mastery and ignoring exp hard cap. Hard cap’s strength lies in making efficient use of SotR. If you’re botching your rotation badly, I suspect that a large part of the hard-cap’s value isn’t realized. Ah yeah, that’s a good point, too. expertise is useless if you aren’t hitting buttons. Thanks for all of your hard work Theck. Once again my stat priority scheme changes (was Exp/Mastery, going Exp/Haste now for more DPS for HM progression) resulting in new gems/chants/forges, but it’s all for the greater good. What kind of an impact do you see this having as far as competition with plate wearing DPS, primarily Frost DK’s, etc, whose gearing strategies are identical to ours now? With us being expected to tank in SoI and therfor making the Battle healer Glyph quite attractive, i’m thinking the increased healing from haste (due to faster attacks so more SoI raw healing) could be significative compared to gearing fro mastery (after hit/exp caps). The extra healing as well as the extra dps is making gearing for haste very attractive. It’s not just SoI and Battle Healer either there’s extra ticks of Sacred Shield to consider as well. I assume if we keep SS up 100% of the time there are no haste plateaus , but if we keep letting it drop off SS will get a big bump in heals each time we get enough haste for an extra tick. This is the most conclusive defensive simulation I have ever seen. And I have been waiting for this since TBC. Really nice work for those involved. Does anyone know if in LFR as a plate tank, you could be awarded a “DPS” plate piece that maybe has hit/exp or hit/haste. If I recall, they said that the LFR loot system would only award you something role specific, which means we’d only get pieces with classic tank stats like dodge/parry/mastery on them. Does this mean I should do LFR as ret to gear up my prot set? I’m also worried that even though Blizz wants us to be using active mitigation, they won’t like us rolling on “dps” plate and may adjust things to make dodge/parry more valuable. So then the question is, what should I spend my VP on? What about the Sha of Anger epic boots quest drop? The dps plate ones are haste/mastery while the “tank” ones are dodge/parry. I’d hate to pick up the “dps” boots only to have blizz adjust stuff to make me wish I had picked up the “tank” ones. * I don’t have that much time to play so I need to streamline my gearing. If you open Dungeon Journal on your tank, go to the loot section & set your spec to Protection you’ll see what you’re eligible for. From memory, the list doesn’t include anything with haste on it. Only gear with any two of Hit/Exp/Dodge/Parry/Mastery, with the possible exception for the two world bosses (who’ll give some also give a limited range of ret items & pvp gear). Great analysis!!! Hey Theck did you server transfer? I keep you and a few other paladins bookmarked and I noticed I could not load your profile. This is fantastic analysis, Theck. I am curious about how ‘practical’ some of the application of the exp/haste vs. exp/mastery stuff is. By this, I mean that if we’re reforging into expertise wherever possible and avoiding dodge/parry on gear (resulting in all gear having two of hit/exp/haste/mastery on it), how should we reforge after that cap? Is it better to go all one way or another, or is a mix of haste and mastery still useful? The scenario I see playing out is that I could end up with lots of pieces that have haste/mastery on them, at which point I’m reforging into expertise and hit, but then which stat do I reforge? Do I simply choose the larger stat, or do I actually go for mastery with some haste (which I tend to think I’d personally prefer) or haste with some mastery (which may make sense in light of some of these simulation numbers)? Ultimately I just wonder in terms of the practicality of gear acquisition whether or not one or two pieces with haste on them make much of a difference. Currently I only have one that has haste, and I ended up reforging that into expertise to work towards the hard-cap anyway, so I’m not sure how valuable it really is. I think that all told, haste will probably be better. They’re both good, but haste gives you a noticeable DPS increase, and mastery doesn’t. We’ll probably end up with a chunk of both on our gear, but my intuition is that we’ll lean towards haste more than mastery. thanks also so when are we using SOI vs SOT??? So far, I’ve been using SoI exclusively. It’s just too strong a defensive skill right now, and not worth giving up for the ~4k DPS of SoT. You get more DPS if you self-heal enough that your healers can spare a GCD to put a DoT on the boss, I think. I love this information, thank you for it. But I can’t help but wonder, at what point do we pass on tank-sepcific gear for DPS gear that we can tank with? Do I take the ring with mastery/dodge and reforge into expertise? Or do I play a game of fisticuffs with the entire group of plate DPS and try to wrestle the exp/haste ring off of them? While it makes sense to us tanks why we need that DPS ring, trying to convince a DPS class that we need it just as much for tanking will prove to be quite difficult. That depends a lot on your guild culture and goals. For example, in my experience the guild sees larger progression gains by gearing up DPS and healers first. So, unless there’s a huge benefit to gearing a tank (ex: T13 4-piece bonuses), we often give them tier pieces first. I think the rationale will be similar here. DPS will probably get the hit/exp/haste gear first (though in later tiers, they may not *want* hit/exp items if they’re struggling to shed excess) and we’ll make do with traditional tanking pieces and reforging. I haven’t macro’d DP and WoG together yet but I’m considering it. What do you think about the synergy between those two skills? It generally takes about 45 seconds to get full BoG stacks, so usually DP will be up when it’s time to WoG. I always feel so squishy every time I decide it’s time to self heal that the decision to hit it seemed pointless. Do you think it would be a good idea to use both of those back to back to try and smooth us out a little more in those cases where a healer decides 3 dps have priority over you for heals (jasper chains stupidity comes to mind). You could, but I don’t think macroing skills like that is ever a great idea. I’d rather hit the skill individually so that I have control over it. Maybe this goes beyond the scope of what questions you’re trying to answer but I’ve been looking at WoG as compared to SotR and it seems to me that I’m getting better results from spending holy power on WoG than from SotR. I’m getting at a minimum 50k out of a WoG and since the buff from SotR only last 3 seconds and is a 30% reduction to physical damage only, that suggests to me that I have to be taking at least 166k physical damage during the 3 seconds following SotR in order for that to be more effective than WoG. The other day I was able to do about 12k hps by focusing about 60% of my HP on WoG. Am I missing something here about why I should prioritize SotR over WoG? I’m not sure where you get 30% dmg reduction from, SotR is 38% with zero mastery rating and 43% with BoM. I doubt many paladins have much under 50% dmg reduction from SotR when in a raid. Though if we get a boss that does very low physical dmg and our dps isn’t needed using WoG as a finisher could well make sense. First: damage prevented is almost always better than damage taken and healed through. I’d much rather prevent 100k damage than take it and heal for 105k, for example. Ramp up those numbers to an extreme and it makes even more sense. Second: SotR will often cover TWO boss attacks, because for most bosses the “default” swing timer is 1.5 seconds. That will vary for some bosses, of course, but even with a 2-second swing timer you can time it to ensure that you overlap and mitigate two swings. Third: Bosses in Mogu’shan vaults can hit for 200k *each swing* on heroic difficulty. Fourth: Your healer does not know you’re going to heal yourself. Presumably, they don’t know how much Holy Power you have, or if you’ve hit SotR by accident, or so on. They’re going to heal based on one major feedback channel – your health. If they see it dip significantly, they queue a big heal. If you WoG yourself, you probably just turned a large chunk of that big, mana-expensive heal into overheal. If, instead, you use SotR and mitigate a big chunk of that damage, your health won’t dip as severely, and they will likely stick with their cheaper heals. Or in some cases, not heal at all and just let HoT ticks and SoI self-healing top you back up, depending on the situation (ex: you mitigate 50% of an attack, absorb half of what remains – you just took 25% of a boss attack instead of 75%, which might be so little that your healer decides they can spare the GCD for something else). Does this mean a tankadin can more or less tank in a fully optimized ret stuff (perhaps changing trinkets only) and not even change reforging? This would be a boon for small guilds, being able to instantly take one roll or the other. Sort of. I’d expect that you’d want more stam gems/enchants than a Ret set would prefer, so doing that would be costly. And Ret would probably have a non-trivial amount of crit on their gear, which isn’t optimal for prot either. But in theory, if you could put a gear set together that was primarily hit/exp/haste, it could serve both purposes. it just wouldn’t do either as well as a dedicated set would. My main question that i have for Theck is the weights that you are using (i am sorry if you have already posted them ) on your reforges and the tool that you are using for it. I am having difficulty maximizing my reforges and i cannot seam to get askmrrobot (i know atm it is bad) on the custom weights to give me what i want. The ones I’m using in AMR are more or less identical to their new “Control/haste” scheme. I actually bump Stam up to 4, hit up to 3, and exp up to 2.9 most of the time, but it doesn’t change much. My one gripe is that it’s not particularly good about maintaining hit cap (hence why I bump the stat weights up, in the vain hope that it’ll be smart enough to over-cap hit rather than drop 0.4% in favor of haste). Can you please tell me what the Pally tank caps are that i need to hit for hit & expertise? If you can give me all of the caps I should be aiming for as well as those two i will seriously love you. There are no other “caps” to really speak of; the closest thing you might care about are the haste thresholds at which you get extra ticks of Sacred Shield, which are 10%, 30%, 50%, 70%, etc., or 4250, 12750, 21250, etc. rating. Theck you have made my week. And have gained a new loyal reader. Thank you VERY much and have a great weekend! Is the control gearing strategy still optimal when your gear isn’t able to cap hit and expertise? Basically for those of us with less than optimal gear should we still push as hard as we can to get hit and expertise cap? And thanks for your analysis, you hear it a lot but you really are awesome. Yes, though not at the expense of stamina. The one thing you *do* care about more than hit/exp is stamina, because at lower gear levels you’ll have a smaller health pool as well. So don’t use blue hit gems – if you don’t have the gear to reforge into hit/exp caps, then you probably don’t have enough stamina to skip the stam gems in the first place. This is excellent work. I’m favouring haste heavily now (after hit and exp of course) but am carrying some mastery with me still also. I am aware of the fact that it’s normally best to push very hard in one direction rather than weakly in another, but something just feels right about balancing the mastery/haste stats I have to 30%/70%. Am I being horribly foolish about that? I’ve not run the numbers but giving that extra mastery just seems to feel less squishy when I do take the big hits in raids (like last night). Also, glyph of the battle healer and SoI is inspired, I didn’t realise that until recently, which obviously benefits from haste, increasing the value. Am I being less than optimal in my slightly piecemeal approach to this and should just man up and go pure haste or is there any opinion that gently increasing mastery at the same time is wise? Keep in mind that the setups in the post are fairly artificial. In most realistic gear setups, you’re going to have some leftover dodge/parry/mastery, as you can’t reforge all of it into haste. I think that in your particular case, it’s not worth worrying about. The difference between control/haste and control/mastery is fairly small. Mixing and matching isn’t going to hurt you significantly, though your DPS will be lower. The advice I’ve been giving is to choose your gear strategy based on level of experience. A beginner tank that’s just learning the ropes should be using an avoidance strategy, because that’s less dependent on player skill. An “intermediate” tank can start shifting to control/haste, which shifts some of that survivability from passive sources to active sources. An expert tank would tend to go control/haste, because they’re capable of the micromanagement required to really reap the rewards of the extra haste. Thanks for that. I’m a control freak and have been tanking since early kara days and whilst many of my heroic raiding buddies might question the ‘expert tank’ label I shall tentatively put myself forward for it! The ability to time a fair chunk of your mitigation seems to fit in well with the reactionary (well, technically anticipatory) way I generally play. If I find myself running low on DPS I shall shout at our resident boomkins instead of going full haste – a small price to pay for the minor improvement in survivability I feel.